The TNS FC Foundation’s All-in activity programme is available to children who find it hard to use standard activities (such as the cubs or brownies) but still want to enjoy sports, clubs and activities with other children. The All-in programme offers a range of clubs, activities and groups with staff and facilities equipped to support children and young people with additional needs and disabilities. 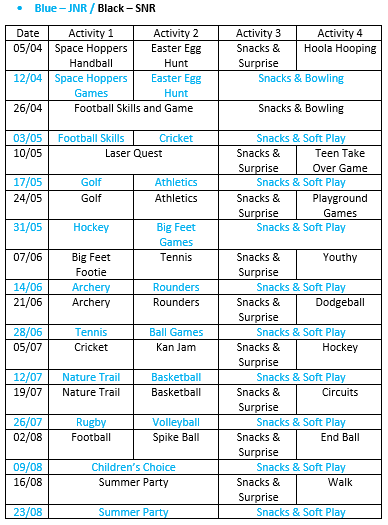 These range from trampolining clubs, swimming, horse riding, football training, youth groups and activity day trips. The Foundation’s All in sessions take place every week on Fridays 5.30pm-7pm for junior sessions and 6pm-8pm for older children. Each session costs £3.50. Please email [email protected] for more information on how to get involved. TNS FC welcomes new members to their friendly, fun group that has a great range of changing activities such as bowling, laser quest, hockey, cricket, basketball, games and other activities. This entry was posted in News on April 14, 2019 by Ruby.